^ Madigan, M. and J. Martinko. (eds.). Brock Biology of Microorganisms 11th. Prentice Hall. 2005. ISBN 0-13-144329-1. ^ Woese, CR. Bacterial evolution. Microbiological reviews. 1987, 51 (2): 221–71. PMC 373105. PMID 2439888. ^ Stackebrandt, E.; Murray, R. G. E.; Truper, H. G. Proteobacteria classis nov., a Name for the Phylogenetic Taxon That Includes the "Purple Bacteria and Their Relatives". International Journal of Systematic Bacteriology. 1988, 38 (3): 321. doi:10.1099/00207713-38-3-321. 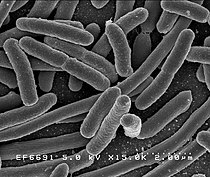 ^ Proteobacteria. Discover Life: Tree of Life. [2007-02-09].